Visit Our Website - RECIPES, ORDERING and INFO! 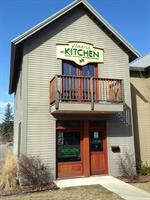 Located behind Ciao Mambos & Quickees in Whitefish. We are one block east of Baker (the road with the bridge to Big Mtn.) on Lupfer Avenue. Less than one block north of route 93/Second St.
SUMMER HOURS: Monday - Saturday 10 AM - 6 PM Sunday 10 AM - ? The age-old quote by Hippocrates 'Make they food thy medicine, and thy medicine thy food' speaks directly to our underlying philosophy. We believe that food should ALWAYS be delicious and good for you! Our olive oils are the freshest in the state; they are extremely good for the body, easy to use, and delicious! We have up to 10 unflavored varieties and 13 flavored. Let us help find the right ones for your palate and typical usage. 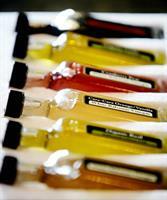 Our Balsamic vinegars are not fresh; they are aged up to 18 years. The aging process is partly responsible for their smooth yet complex flavor. We offer dark and white balsamics, both flavored and traditional. With over 20 balsamic varieties it can be a daunting task finding the best match for you - we specialize in narrowing down the options to just a few that suit you best. Still too many choices? Our 6-bottle sample set is a great way to take home a taste of several flavors, or to send a wonderfully diverse gift (includes a foam shipping sleeve!) In addition to our Oil & Vinegar selection we offer several fine Organic collections; Spice Blends, Raw Olives, Raw Granola, Sunwarrior Protein Powder, and Raw Cacao Treats (made here in the store!) We have gift baskets, shipping service, and corporate/wedding options as well. For a truly unique event venue we offer our tasting room after-hours for private functions. These are tailored to meet your needs whether they be a traditional oil tasting or a more social atmosphere with wine and appetizers. Contact us to learn more and to schedule your event today.